Hawghunters of Allentown veteran, Mike McNicholas, ended his season just how he started it; with a gritty win at a Pennsylvania lake. McNicholas, who spends most of his time competing on the FLW Costa Northern Division tour, bagged four smallmouth for 9.79lbs. at Lake Wallenpaupack, earning him bookend victories for 2018. His bag was anchored by the day’s lunker, a 3.88lb. Paupack pig. Most impressive is the fact that McNicholas beat out two other anglers who weighed in limits. Jon Hardenberg wrapped up his strong season with a mixed limit for 8.63lbs. and second place. Rider Willie Gilbert secured his best finish of 2018 and first-ever PA limit with five smallies for 8.25lbs. Mitch Metcalf, 7.62lbs., and Charlie Harris, 6.73lbs. rounded out the top five. Going into the day, all eyes were on Metcalf and Harris who were sparring for Angler of the Year. Despite a valiant effort from Harris, Metcalf becomes the first back-to-back AOY in quite some time. Metcalf’s two-day sweep at Oneida Lake proved to be the difference maker. While Oneida didn’t live up to its reputation, Metcalf was the lone angler who was able to piece together a two-day pattern. Harris was a factor in almost every tournament this season and his victories at Cayuga and the Upper Bay kept the race tight late into the year. Metcalf ended the year with 1360 points while Harris was right on his heels with 1230. Hardenberg kept both anglers honest with 1050. It was a different story on the Co-Angler side as Evan Rehrig claimed his first Co-Angler of the Year title. A victory at Fairview Lake and top five finishes at Merrill Creek, Cayuga and Nockamixon allowed Rehrig to run away with his first major club title. Junior angler Cooper Rosen had the Co-AOY lead early in the season and a win at Cayuga put the field on notice. Jason Penrose secured his best season with the club, finishing in third place. Rehrig cemented Co-AOY with 1200 points over Rosen’s 865 and Penrose’s 850. Surprisingly, both Largemouth and Smallmouth Lunker of the Year came from the Merrill Creek tournament in May. Cooper Rosen sent shockwaves through the field when word spread that he landed a 7.75lb bucketmouth early in the morning. It was the biggest fish caught in a HOA tournament in recent memory. Smallmouth lunker honors went to Zach Seip who boated a behemoth 4.50lb. bronzeback. HOA would like to thank Wacky Worm Inc., Angler’s Pro Shop, Old School Sandwich Co. and Tricky Phish Bait Company for all of the support in making 2018 such a success. Our club wholeheartedly appreciates your sponsorship and it means a great deal to the success of our anglers and our club. Lastly, a huge thank you to the families and friends of our club members. Because of you, our guys are able to do what they love to do despite the early mornings and long weekends. After a brutal August tournament at the Upper Chesapeake Bay, the Hawghunters of Allentown looked forward to heading north in search of packs football-shaped smallies at Oneida Lake. Unfortunately, like many 2018 tournaments, Oneida was a letdown, at least by New York standards. The lake has been struggling with a bacteria issue that is severely impacting fish. Nonetheless, Mitch Metcalf, the angler who seemingly puts in more time on the water than anyone in the club, sacked two limits en route to 1st place finishes on Saturday and Sunday. On Day 1, Metcalf went without a bite until 1:30pm, when he discovered a small area loaded with largemouth. Despite nearly “spinning out”, he capitalized on five key bites, landed each fish and weighed in 12.21lbs to claim victory. Ricky Ritter, making his first trip to Oneida, shook off an early self-inflicted wound that was courtesy of a little Friday night fever to earn second place honors with two largemouth and two smallmouth for 9.88lbs. Ritter benefited from two days of practice which allowed him to break down the large lake and identify key areas that held fish. Burr Shaw (9.13lbs. ), Harrison Hunter (9.05lbs.) and Gerald Polachak (8.40lbs. ), who also took lunker honors with a 3.55lb. bronzeback, rounded out the top five. Metcalf, Shaw and the newly wed Mrs. Marie Metcalf, who fished with her husband, were the only anglers to weigh limits on the first day. On Day 2, competitors were met with a large tournament launching out of Oneida Shores in addition to a cold front and dense fog. Though it was a new day with different conditions, the results were similar. Metcalf returned to the scale at 1:30pm with the only limit of the day, a mixed bag for 12.90lbs. and a performance that may very well seal his second consecutive Angler of the Year title. Charlie Harris, who has led the AOY race most of the year, finished second with three fish for 5.51lbs. Shaw (3.42lbs. ), Rudy Pohl (3.41lbs.) and Jason Penrose (2.82lbs.) finished 3rd through 5th, respectively. HOA will conclude its 2018 club tournament trail on October 14 at Lake Wallenpaupack. Harris will do all that he can to challenge Metcalf for the AOY title, though it’s close to being out of reach. On the Riders’ side, Evan Rehrig has the Co-Angler of the Year title all but wrapped up, despite his worst performance of the year at Oneida. With cooler temperatures approaching, HOA may just find the bite they were looking for in New York a little closer to home. Brutal|adjective | bru·tal: 1. Very bad or unpleasant. 2. The only way to describe the fishing the Hawghunters of Allentown endured at the Upper Chesapeake Bay on Saturday, August 25. Due to the excessive rains and flooding in July and August, anglers anticipated a tough tournament on the Bay when they launched out of Anchor Marina. However, they did not anticipate that it may have been, unofficially, the worst tournament at the famed Maryland fishery in the club’s history. But, when the fishing is less than ideal there is one angler who has proved time and time again that he can find the fish. Charlie Harris, grinded out two largemouth for 4.57lbs., enough weight for him to capture his second club tournament victory of the season. Most impressive is the fact that Harris won using only his trolling motor after discovering an outboard issue late Thursday evening. The win catapults him into the lead for Angler of the Year. Most anglers spent the day poking around the North East River, where they found the cleanest water. A few did venture out to the flats which were, essentially, unfishable. “I’ve seen coffee clearer than that water,” remarked Harrison Hunter. Of the 11 anglers in the field, only five were able to put fish in the livewell. 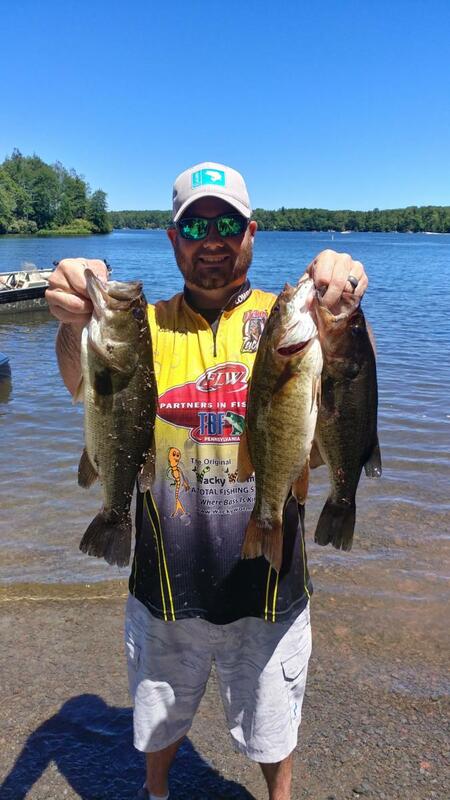 Fresh off his win at Lake Nockamixon, Jon Hardenberg finished in second place with two largemouth, weighing 3.40lbs., thanks to a last minute catch. Right on his heels was Mitch Metcalf with 3.09lbs. Metcalf and Hardenberg join Harris in a tight and crowded race for AOY. Brian Christy, 2.20lbs., and leading Co-AOY Evan Rehrig, 1.06lbs. rounded out the top five. HOA will quickly put this one in the rear-view mirror and set its sights on Oneida Lake in September. The New York smallmouth factory will play host to the club’s second two-day tournament of the season and figures to play a major role in determining the 2018 AOY and Co-AOY. Hawghunters tournament at Lake Nockamixon, sponsored by Angler’s Pro Shop, started with an hour delay due to strong thunderstorms and heavy rain passing through the area. Immediately following weigh in, another round of thunderstorms came through with multiple cloud to ground lighting strikes that sent everyone running for their trucks. But during tournament hours, it was Jon Hardenberg that was striking on a quality bag of fish to claim first place. 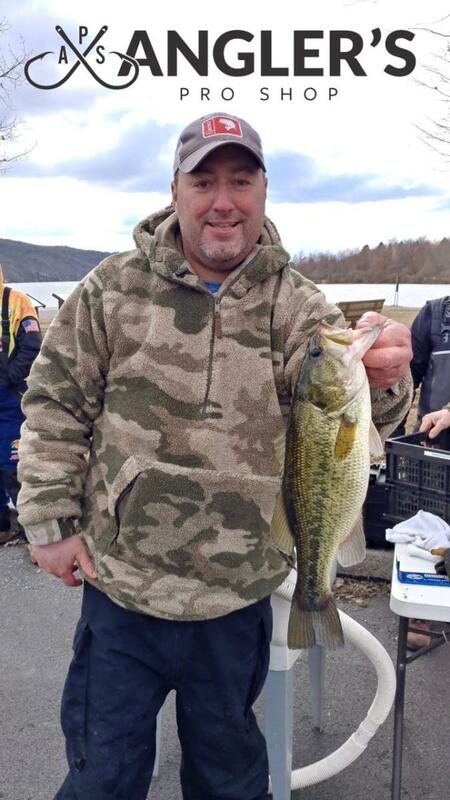 Hardenberg was able to pre-fish for this event and found a variety of fish biting including crappie and catfish and was able to find a few bass over the minimum 15 inch size restriction. That was enough for him to have confidence in an area to work it thoroughly during the tournament. His day started with two fish under 15 inches and then caught his first keeper that was 15 ½ inches. The rain continued to fall with heavy downpours through the first several hours of the tournament and the fish continued to bite. Within that window, he continued to catch keepers that were the size fish he needed to win with each of them in the three pound class. Still having the 15 ½ inch bass in his livewell he knew he needed to cull that fish to have a chance at winning, that’s when he caught lunker for the day. His big fish weighed 4.71lbs. at the scale and beat out several other fish that weighed over four pounds in the tournament, pushing his four fish limit to 14.61lbs. and a margin of victory by almost four pounds. 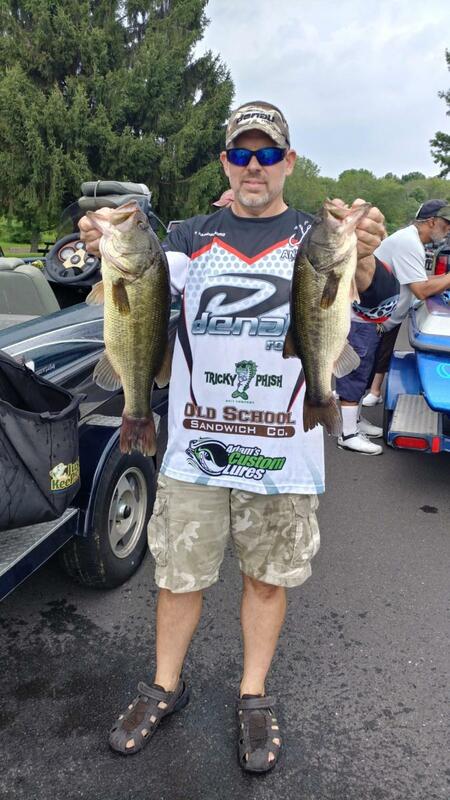 Second place went to a familiar name on Lake Nockamixon, Tony Slotter, fishing this tournament as a guest boater. Slotter’s four fish limit weighed 10.73 pounds with a 4.12lb. pound kicker, the only other limit for the day. Bruce Fox took third with three fish for 8.37lbs. and Evan Rehrig claimed fourth with 7.07lbs. and three fish. Charlie Harris rounded out the top five with two fish for 5.87lbs. Along with cash payouts, Angler’s Pro Shop provided gift cards as prizes. Point standings and most weight for the year continue to shift on the Angler side with Hardenberg taking the lead for most weight of the year and several anglers in the chase for Angler of the Year. On the Co-Angler side, Rehrig continues to improve his chances for Co-Angler of the Year and most weight. Hawghunters’ next stop will be the Chesapeake Bay with hopefully better conditions that they Bay has seen this year. With an unusual amount of rain and flooding this year the Bay has been faced with high muddy water and debris causing many tournaments to be cancelled including the recent Bassmaster Elite series and several Hawghunters’ buddy tournaments. The Hawghunters of Allentown marked the halfway point of its season at Fairview Lake on Saturday, July 7. When the tournament committee added Fairview to the schedule, it expected to be returning from a shootout at Cayuga Lake and figured a small lake with less pleasure boat traffic would be a complete change. Both accounts were correct, where it took almost 18lbs. to win at Cayuga, it would take less than 6lbs. to win on this day. While the weights were low and the bites were few and far between, leading Co-Angler of the Year Evan Rehrig was able to boat three fish for 5.78lbs. to earn his first career victory with the club. After failing to connect on his first two topwater bites in the morning, the third time was the charm when his Lobina Rico (Ricci’s Recipe) found its way into the top lip of a smallmouth. Rehrig then went almost seven hours without a keeper before hooking into two largemouth with an hour to go to seal the deal. Both fish succumbed to a Strike King Dream Shot in Watermelon Red Flake rigged on a VMC Spinshot with a 12” leader and 1/4oz. weight. Rehrig benefitted from boater Ron Hebert’s experience and ability to graph fish off shore. A long-time member of the club, Hebert spent his Fourth of July battling pleasure boaters and jet skis to piece together a game plan. Current leading Angler of the Year Mitch Metcalf finished in second place with 3.62lbs. His bag was boosted by the day’s lunker, a 2.46lb. Fairview stud. Mark Fenstermaker, who recently won on the Co-Angler’s side at the BFL on Lake Champlain, finished in third place with two fish for 3.42lbs. Hebert (2.99lbs.) and Charlie Harris (2.57lbs.) rounded out the top five. HOA’s 2018 club tournament series now turns the corner toward the second half of the season. 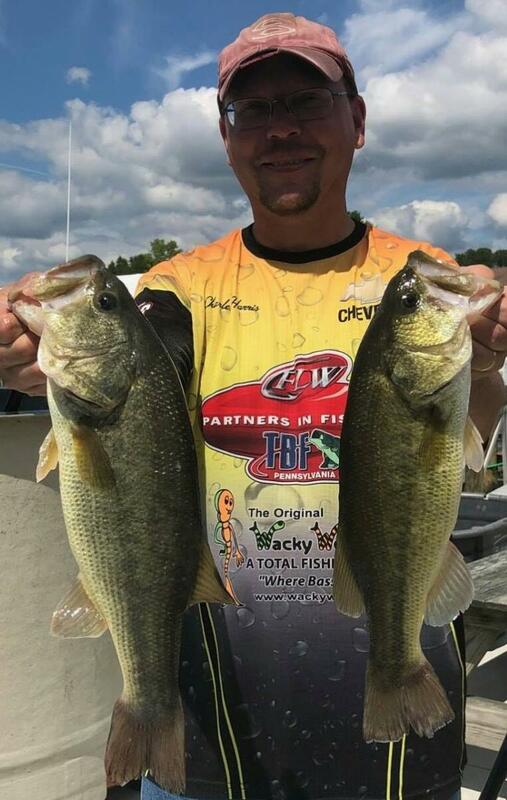 Anglers are looking forward to competing at big-fish waters, Lake Nockamixon and the Upper Chesapeake Bay in August, and a two-day derby at Lake Oneida in September. The season will then wrap up at Lake Wallenpaupack in October. With summer in full swing, it’s appropriate that the races for AOY and Co-AOY are heating up. To view the current standings, please visit www.hawghunters.org. For the third consecutive summer, Hawghunters of Allentown made the four-hour trek north to Cayuga Lake for its first two-day tournament of 2018, sponsored by Tricky Phish Baits. 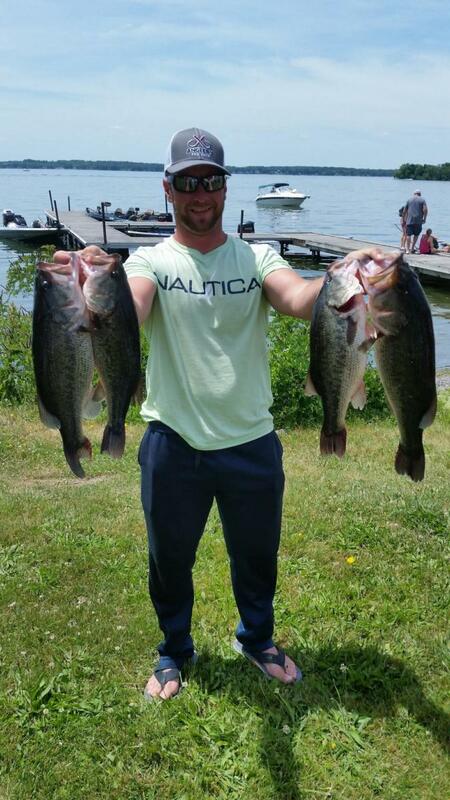 And, once again, Cayuga proved why it’s one of the top bass fishing destinations in the country. On Day 1, 13 of 18 competing anglers tipped the scales with five fish limits. Weights were tight and consistent, but the teen in the Alabama hoodie struck again. Junior angler Cooper Rosen continued his 2018 tear with a 16.94lb limit, anchored by the day’s lunker, a 4.11lb. Cayuga stud. Rosen edged out reigning Angler of the Year Mitch Metcalf whose 16.84lbs. limit of largemouth landed him in second place. Zach Seip (14.50lbs. ), Rich Langham (14.58lbs.) and Evan Rehrig (13.89lbs.) rounded out the top five. Typically, weights are not as strong on the second day of a multi-day tournament. Not for the Hawghunters at Cayuga. Charlie Harris, a known force in New York, rebounded from his day one performance, to capture the win with 17.70lbs. While it was no shock to see Harris bounce back, it was surprising to see Charlie without a smallmouth all weekend as he would routinely weigh in a token bronzeback in previous years. Langham continued his strong weekend, claiming second place with 17.24lbs. Langham’s limit was boosted by the day’s lunker, a 5.24lb toad. Metcalf (17.06lbs.) remained at the top of the leaderboard with a third place performance. Rehrig (14.73lbs.) and Ron Hebert (14.07lbs.) finished in 4th and 5th, respectively. Metcalf’s consistency and two-day weight of 33.89lbs. earned him the tournament championship and trophy. As a club, HOA brought 156 fish for 389.26lbs. to the scales for the weekend and successfully released 155 of them. Thanks to tournament sponsor, Tricky Phish Baits, all anglers walked away with some great soft plastics. While the official big bass of the weekend weighed in over 5lbs., the unofficial lunker award went to HOA member Ricky Ritter and his wife Casey as they welcomed their first baby into the world! Owen Lucas Ritter, and future HOA member, was born on June 14th, weighing in at 6lbs. 12oz. The weather and races for Angler of the Year and Co-Angler of the Year are both heating up. Currently, Metcalf holds a 20 point lead over Seip for AOY. The scenario is essentially the same on the Rider’s side with Rehrig leading Rosen by 20 points. Many anglers are within striking distance and it should make for an exciting second half. HOA continues its club tournament trail at Fairview Lake on Saturday, July 7. 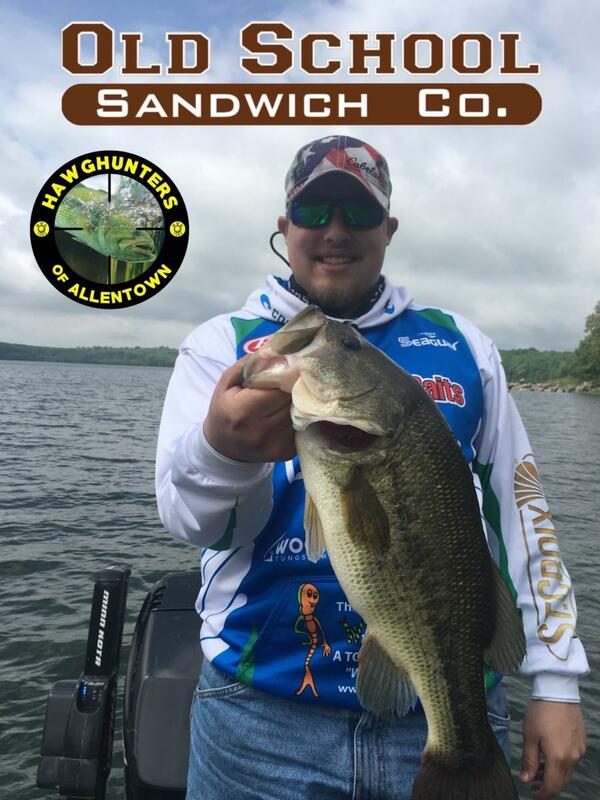 The Hawghunters of Allentown made its third stop of the 2018 club tour at Merrill Creek Reservoir in New Jersey on Sunday, May 21, sponsored by Old School Sandwich Company. Expectations were high, considering the lake produced some of the best weights almost exactly one year ago. However, the 24 competitors were greeted with a thick, difficult-to-navigate fog, forcing some anglers to abandon their game plans and others to lose their way en route to the far shoreline. But, the field still found the fish. Early on, a rumor began to circulate that someone caught a 7lber. That report was verified at weigh in when junior angler Cooper Rosen weighed in a 7lb. 12oz. behemouth, putting him in strong contention for lunker of the year. Rosen was fresh off his victory at the Lehigh Valley Junior Bassmasters win at Merrill Creek two weeks ago when he weighed in a mixed limit of 15lbs 5oz. Unfortunately, the young angler was unable to capitalize and finished in fourth place with 12lbs. 5oz. First place honors were claimed by guest co-angler Jacob Stem, fishing in his first HOA tournament. Stem bagged a limit for an impressive 16lbs. 12oz., earning more than $200 in prize money. Another co-angler, Evan Rehrig, finished in second place with a 13lb. 7oz. limit of smallmouth. Rehrig and his boater, John Palmer, didn’t have a bite until 12pm, when the sun finally made its first appearance of the day. After exploring most of the lake, the pair found promising water and promptly loaded the boat in two hours. Rehrig’s bag was anchored by two 3lbers. and two 2lbers. The two anglers arrived at the ramp with 15 minutes to spare. Palmer was one fish shy of a limit and with other competitor boats close, he made a cast and turned to another boat. “I still have five minutes to get that last one… just like that!” And just like that, Palmer caught a keeper largemouth, the first one in his boat all day. Angler Zach Seip claimed third place, his best career finish, with a 13lb. 5oz. limit, including a 4lb. 8oz. smallie kicker. Rosen and Palmer, 10lbs. 13oz. rounded out the top five. While the fishing was good, the highlight of the day for most was the 17lb. 3oz. worth of giant hoagies, provided by tournament sponsor Old School Sandwich Co, located at 7540 Windsor Dr in Allentown. Old School offers some of the best sandwiches in the Lehigh Valley and offers catering for almost any event. HOA now turns its attention to the most anticipated tournament of 2018 at Cayuga Lake on June 16-17, sponsored by Tricky Phish Bait Company. The New York finger lake has been good to the bunch in the past two years where big fish and big limits tend to be par for the course. Over the past few years, there has been a youth trend on the Bassmasters Elite Series with Jordan Lee winning back-to-back Bassmaster Classics and Brandon Palaniuk being the reigning Angler of the Year. If the first two tournaments of 2018 for the Hawghunters of Allentown is any indication, that movement may be trickling down to the club level. Fishing in his first HOA tournament, Junior Angler Matt Karnas took home the victory fishing from the back of the boat at Lake Swartswood in New Jersey. Karnas weighed in two fish for 7.0lbs., besting 19 other competitors and edging out Ricky Ritter by a mere 3oz. In addition to claiming first place points, Karnas also earned lunker honors by landing a 5.38lb. bucket mouth, making his pay day even more fruitful. Ritter was on the right fish in the right area and gave the young angler a run for his money, but was unable to coax one more bite. He weighed in one largemouth and one smallmouth for 6.81lbs. Junior Angler and new HOA member Cooper Rosen followed up his second place finish at Beltzville with a third place performance, weighing two fish for 6.75lbs. Jon Hardenberg (6.06lbs.) and Jason Penrose (5.38lbs.) rounded out the top five. This was HOA’s first visit to Swartswood in a few years, but the small electric-only lake boasted some impressive fish. In total, nine fish over 3lbs. were weighed, including three in the 4lb. class. Many anglers found water temperatures just shy of 50 degrees holding active fish. According to the talk at the dock, a variety of lures and techniques were successful with some competitors focusing on a reaction bite while others opted to finesse the fish. With warm spring weather finally arriving, a good bite and the spawn shouldn’t be far behind. HOA will continue its club tournament series on May 20 at Merrill Creek in New Jersey, sponsored by Old School Sandwich Company, located in Allentown, PA. The Hawghunters of Allentown kicked off its 35th season at Beltzville Lake on March 25, sponsored by Angler’s Pro Shop in Souderton, PA. Sporting bibs, parkas, gloves, beanies and hand warmers, twenty dedicated, die-hard anglers braved freezing temperatures and snow showers in an attempt to piece together the challenging puzzle that is Beltzville. Long-time HOA member and FLW Costa regular Mike McNicholas earned HOA’s first club victory of 2018, weighing in one Largemouth for 2.63lbs. His rider, Cooper Rosen, an HOA prospective and Lehigh Valley Junior Bassmasters member, benefitted from McNicholas’ experience and was the only other participant to weigh in a fish, a 2.34lb. smallmouth. The field was plagued by sub-forty water temperature, lethargic fish and frozen rod guides. Beyond the weather, pickerel catches and lost fish were the topics of conversation at weigh in. The field was spread far and wide, shallow and deep all over the lake, but only McNicholas and Rosen had the answer. Angler’s Pro Shop, a returning sponsor for 2018, provided hats and gift cards which were raffled off to members at the conclusion of the tournament. Angler’s Pro Shop carries a wide selection of gearing including top fishing brands G-Loomis, Shimano, Seaguar, Huk and much, much more. HOA members will regroup and look forward to warmer weather at its second derby of the year at Swartswood Lake in New Jersey on April 22.